It has been four years since the tiny desktop unit has seen a refresh so it might not be a surprise that there have been significant hardware upgrades. The base unit is powered by a 3.6GHz Intel Core i3, 8GB of 2666MHz DDR4, and a 128GB SSD. This one will run you $799, which is $300 more than the previous iteration’s base configuration. The price bump seems to be the primary complaint with most reviewers. By jacking up the price 60 percent, Apple is moving away from the entry-level macOS machine that was the Mac mini of old as Brian Heater from TechCrunch points out. The Mini has long been Apple’s entry-level desktop. The $499 price tag on the 2014 model certainly highlighted this fact. With a $300 price bump, the latest version still represents the lowest cost path into the world of desktop Macs, but arguably removes ‘entry’ from the equation. Indeed, the Mac mini has a wide range of options over the $800 base model. Apple has a second preconfigured setup for $1099 that bumps the processor up to a 3.0GHz 6-core Intel Core i5. It comes with the same 8GB of RAM as the low-end model, but doubles the storage capacity of the SSD. Both models come with 10/100/100Base-T Ethernet, but that can be upgraded to the faster Nbase-T Ethernet for $100. Also notable is the number of ports available in the new Mac mini. Digital Trends reviewer Julian Chokkattu thinks the extra connectivity is a welcome albeit expensive addition. 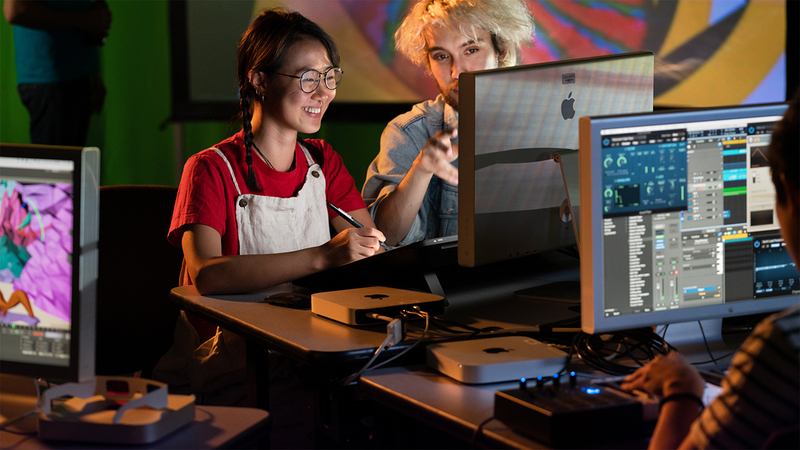 Over on the back is an impressive array of ports including four Thunderbolt 3 USB-C ports, which means you can connect it to 4K or 5K Thunderbolt displays, as well as an external GPU. That is a ton of Thunderbolt 3 ports. In fact, it might even be too many, if that’s even possible. It’s the same amount that grace the iMac Pro, and it most certainly has increased the already hefty price tag of this PC. Along with USB-C, there are also two USB-A 3 ports, one HDMI 2.0 port, as well as a 3.5mm headphone jack. An Ethernet port is also available, and it’s configurable up to 10Gb Ethernet for super-fast connections. Overall, we’re happy Apple beefed up port selection rather than cut back. Apple has switched to a “100-percent recycled aluminum” chassis, but cosmetically it looks about the same as the 2014 model other than its new "Space Gray" color. Cupertino seems quite proud about the fact it is using recycled aluminum in its newer computers as AppleInsider’s Andrew O’Hara notes in his write-up. 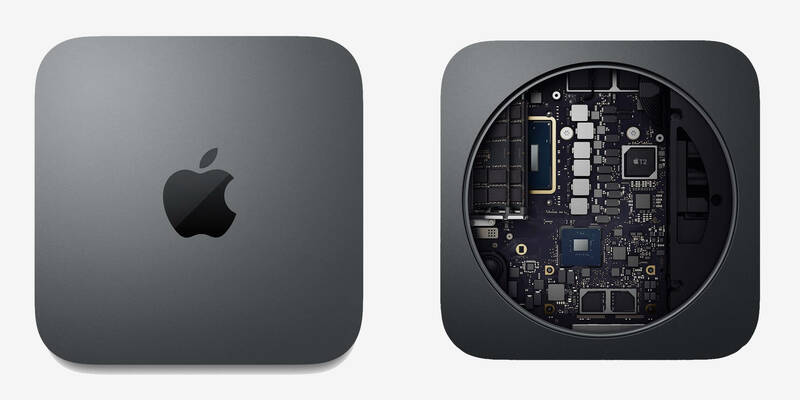 Initially, the Mac mini looks like a lot of the same. It has that same stout body, just with a new finish. We wouldn't hold it against you if you confused the new mini for the old. Apple made a big point to note that like the MacBook Air, the Mac mini's enclosure is made from 100-percent recycled aluminum. The quality of the metal looks as good as ever, creating a great and minimalistic look. From a performance standpoint, the 2018 Mac mini has been compared to last year’s iMac. It packs a lot of power into a small form factor, especially at it’s max configuration (3.2GHz Intel Core i7 w/Turbo Boost up to 4.6GHz, 64GB DDR4, 2TB SSD, and 10 Gigabit Ethernet). Of course, for professional power like that you’ll pay a professional premium of $4,199. ZDNet’s Jason Cipriani benchmarked the Mac mini and was quite satisfied with the results. He said it seemed unencumbered by any task he threw at it, and it was remarkably quiet. I ran benchmarking software Geekbench 4 a few times. The Mac mini averaged a single-core score of 4,756 and a multi-core score of 14,426. I also ran Cinebench R15, and the Mac mini averaged 41fps in the OpenGL test and scored 588 in the CPU test. What do those numbers mean? Well, those results put the base model on par with a 2017 iMac equipped with an Intel Core i5-7500. In regards to multi-core, the Mac mini performs just as fast as a 2015 MacBook Pro with an Intel Core i7-4980HQ. As the Mini handily went from task to task, without any hangups or issues, I kept waiting for the fan to kick on. Even as I was exporting a video, streaming a YouTube video, and reading through my Twitter timeline, I realized I was yet to hear the fans. I felt the top of the Mini, and it was warm. So turned off all audio, and leaned really close to the enclosure. Only then could I hear the whirr of the fans. They are stunningly quiet, which was something the company strived for. Often times, the Mini is used in music studios or on film sets where loud fans aren't welcome. Let me say it another way: The external hard drive I used for Time Machine on my iMac is louder than the Mac mini's cooling system. John Burek with PC Magazine performed a teardown of his review unit and said it looks mostly the same on the inside except Apple seems to have switched to an upgradable RAM configuration. 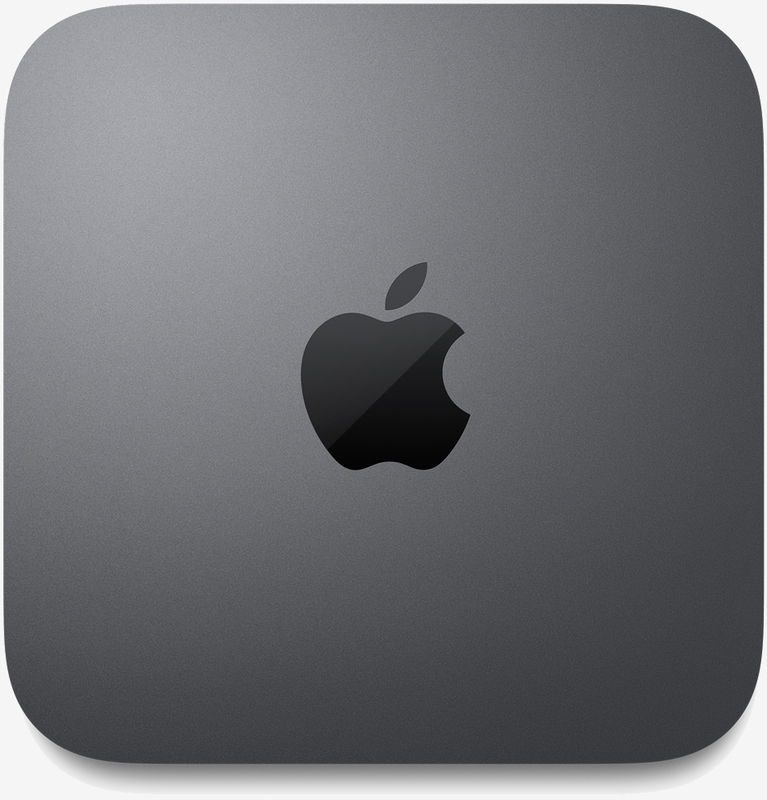 Apple has implemented the memory in the new Mac mini as laptop-style SO-DIMMs. The company doesn't deem this a user-accessible upgrade, though it says authorized service centers and Apple Stores will be able to perform memory upgrades. That said, a couple of Apple reps we spoke to suggested usual-suspect memory retailers (I'm thinking folks like Crucial and OWC) might be able to produce memory upgrade kits with instructions. When I popped off the bottom, I noted that the perforated panel was held in place by star-headed security screws. That's an intimidating removal prospect for most casual users, but it's definitely a step ahead of the soldered-RAM design that came before. The only other real gripe seems to be the Mac mini’s lack of display and input devices. However, it has never come with these components anyway, so it is not unexpected. Plus, as Macworld’s Roman Loyola points out, you can still purchase a Mac mini and all the necessary accouterments for less than the $1,499 iMac and have comparable performance. There are customers who lament the fact that Apple no longer offers a Mac for under $500, and that Apple went from offering three desktop Macs for under $1,000 to just one. But this is the new reality: $799 is the new entry point, and it’s not going to go any lower. That being said, at $799, the 3.6GHz quad-core Core i3 Mac mini offers an intriguing combination of performance and value. In many instances—especially with multi-core apps—the Mac mini is as fast as the current $1,499 21.5-inch 3.4GHz quad-core Core i5 iMac (which was released in 2017). You could you decide to buy a new 4K display and input devices with a $799 Mac mini instead of a $1,499 iMac, and you’ll save a little bit of money while getting comparable performance. It seems that Apple is okay with sacrificing some entry-level macOS converts in favor of giving the Mac mini the guts to do professional level work. With the broad range of configurations and an expanded port selection, most reviewers are saying that upgrading from a 2014 model to the new one is a “no-brainer.” You might want to shell out a little more for a bigger SSD though — 128GB is probably not enough room for growth. 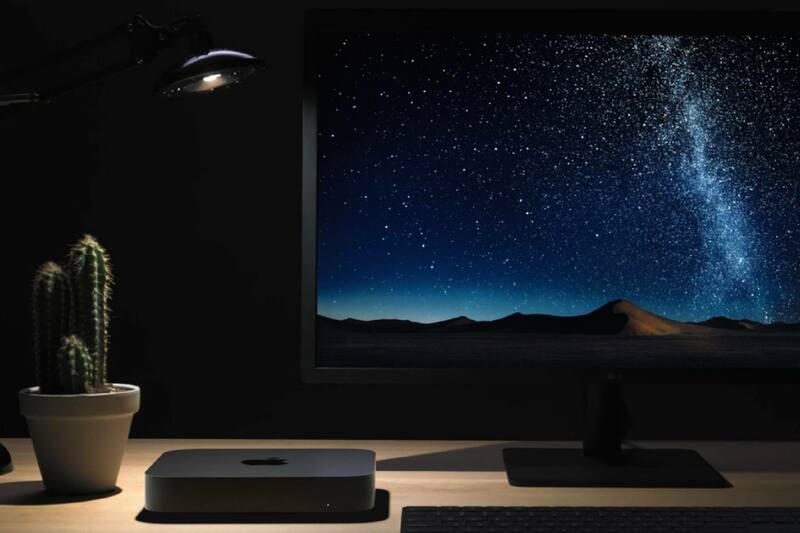 The 2018 Mac mini is available starting tomorrow, November 7, from Apple, Amazon, and other retailers. Pre-orders are also available if you want one shipped immediately upon release.